Six seems to be our number – the amount of times we shovel our driveway, walkway and door entrance during a snowstorm. Actually ‘shovel’ doesn’t quite do justice in describing what most in Maryland have experienced this winter, where the snowfall record has already been eclipsed by nearly 20 inches. Digging is more appropriate – digging out. 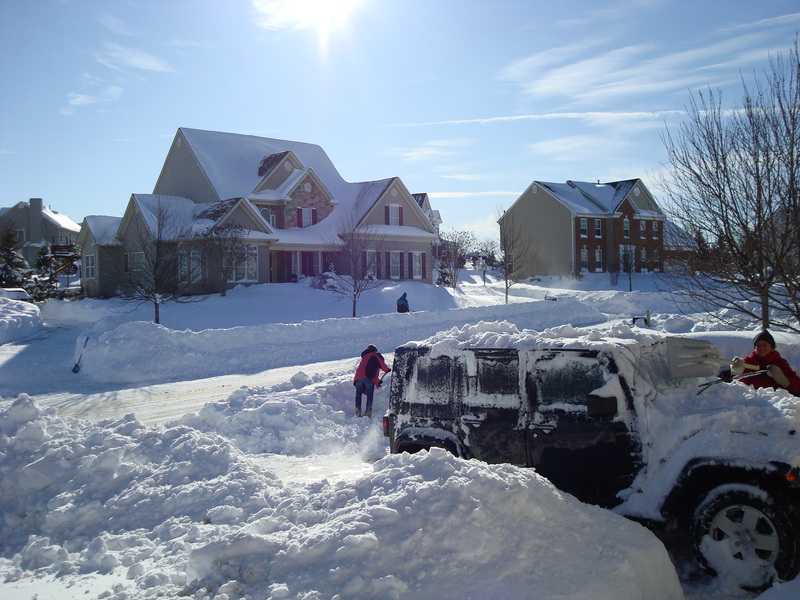 In the last ten days we have had over four feet of snow in the Greater Baltimore area. Ordinarily, when you look at most homes what you will see is mailboxes, driveways with parked vehicles, walk ways leading to front doors, steps and shrubbery. To put these past two weeks into perspective, all of these were either completely or almost entirely covered by snow. Needless to say, a whole lot of cleaning has been going on. Clean up becomes a philosophical issue. Somewhere in the experience a core decision is made, that being whether you clear the vital areas (driveways and entrance walk ways) incrementally as the snow falls, or just wait until it stops, and then clean up in one effort. There are advantages to each and opinions are all over the map. But at the end of the day everyone has to dig out, and the work is backbreaking and exhausting. In thinking on this it struck me that digging out is my natural tendency. Perhaps something dark within constantly wants to reject the Gospel and instead, to fix my own messes. But the fact is that in digging out I am desperately avoiding that moment of facing my sin for what it is and does. Actually it is even more personal than that. It is raw unbelief in the Gospel because the Gospel always offers Jesus, who never deals with us apart from relationship. Every attempt to dig myself out is a rejection of Christ and an expression of unbelief that He will love and forgive me past His disappointment. I don’t want to face Jesus, but He will never allow me to circumvent the kind of face to face encounter that Peter experienced when he denied Christ. In true relationship, love demands our joy and our disappointment, our loveliness and our ugliness. Digging out is hard. It is more formidable than shoveling snow because the mound of my propensity to rebel never diminishes. But to attempt to dig out is to rob myself of Jesus, whose disappointment is never expressed independently of His mercy, grace and forgiveness. This is what we have in true relationship. To face Him is to trust Him and to believe that He loves us – even in our unloveliness. This is what makes it all real. This is the ‘stuff’ of true relationship. Very neat that you took this and applied it to the Gospel. I think I need to be so saturated in the Gospel that I see things like this through its lenses. I’m not there yet. As you might have expected, I’ve tried digging myself out of grief. It didn’t work either. Thanks brother…I can really relate to this right now! You are currently reading Digging Out at unfinished1.